A recent poll of readers of my Embedded Muse newsletter (http://www.ganssle.com/salsurv2006.pdf) turned up some interesting results. We're getting old. 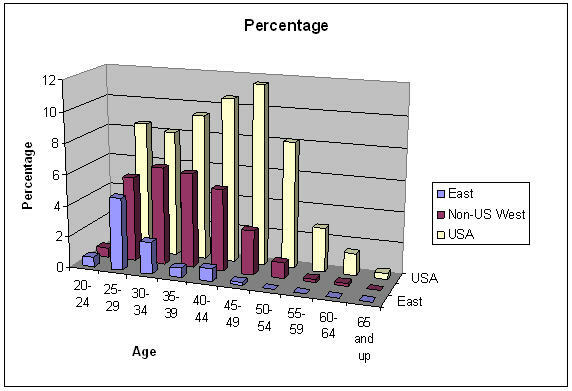 At least, in the US, embedded developers are, on average, much older than those in the rest of the world. I somewhat arbitrarily divided responses into three geographical areas: the US, the rest of the "Western" world (Europe, Australia, Canada, etc), and the "East" (India, Asia, Middle East, etc). The results are plotted below, though the data is skewed somewhat by the fact that these readers are all necessarily English-speakers. "Percentage" is the percent of total respondents. The results are striking. Few Eastern developers have gray hair. One could argue that the developing world is, well, developing, and hasn't been employing lots of high tech workers till recently. Yet on a recent trip to Asia engineers told me that they are expected to be out of the trenches and into management by the time they have 10 years of experience. As early as 1973 I worked in Japan, Malaysia and Indonesia with engineers building hardware and firmware. The numbers were small, then, but there weren't that many embedded folks here at home, either. Microprocessor development has a long history in all corners of the world. Europeans have been just as engaged with embedded systems as Americans since the very dawn of the microprocessor age, yet their workforce is significantly younger than America's. Both Europe and the East show a bulge of young folks. 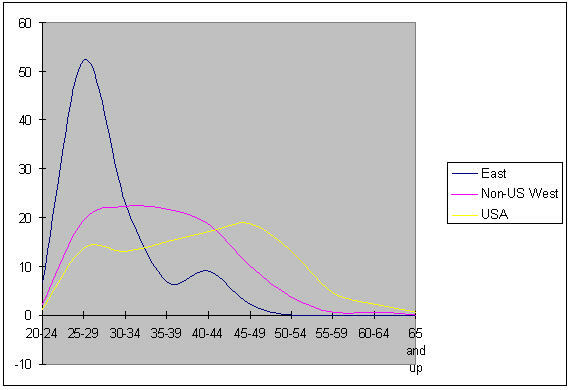 In the US the bulge is more one associated with middle-aged waists, peaking at 45-49 years of age. Offshoring, a relatively new phenomena, simply can't account for this effect. Either engineering college enrollments decreased twenty-five years ago, or young folks are abandoning the profession. The September 2005 issue of Today's Engineer (http://www.todaysengineer.org/2005/Sep/pulse.asp) suggests the latter. I worry that as US engineers retire few young folks will be around to take their place. One can hope the law of supply and demand will kick in: open slots will drive salaries up, making the career more appealing. However, for that to work some force will have to compensate for anecdotal reports that school kids in the US just aren't doing well in math classes. What's your take? What's the future of engineering in the US?